Marcus Trescothick and Imran Tahir proved that there’s a bit of ‘life left in the old dog’ as both enjoyed themselves under the blazing hot Trent Bridge sun. Trescothick, belying all of his 40 years, has been on the field for every ball during the first three days of this Specsavers County Championship match. Beginning the day with an unbeaten 117 to his name, the first time he had reached three figures in Nottingham, Trescothick went on and on and on before being last out for 218. The left-hander batted for a total of 491 minutes and faced 355 balls, hitting 32 balls and a six, to help his side to 437 all out, a first innings lead of 36. Not one chance – or even a semblence of one – was offered until he pushed firmly at Tahir and picked out Brendan Taylor at extra cover. By that stage he’d not only converted the seventh double hundred of his career but he had also passed 1,000 first class runs for the season. Tahir, a mere 38 year old, celebrated enthusiastically at getting rid of the former England international, just as he had at taking all of his other wickets on his way to figures of seven for 112. 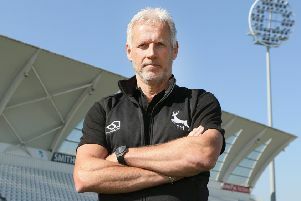 In just his third first class match for Notts, he had done what no other overseas bowler had done for the county since 2004, in taking a five-fer. Stuart MacGill, a fellow leggie, had helped himself to seven for 109 against Essex at Southend in 2004 and no-one – not even Siddle or Philander or Hilfenhaus or Bird or one or two more - had repeated the feat since then. Without Tahir’s monumental effort the home side may have found themselves well adrift in the overall match situation but he struck early to remove nightwatchman Leach and then tore through the lower order, either side of tea. The only substantial partnership of the day, 102 for the fifth wicket, was eventually halted by Samit Patel, who bowled Jim Allenby for 63. When Notts batted for a second time they lost two cheap wickets before they had wiped out the deficit. Craig Overton claimed his fifth wicket of the match as Steven Mullaney was pinned deep in his crease for 11 and then Allenby fired one through Michael Lumb’s gate to flatten his middle stump for nought. Jake Libby, who made 90 on the first day, was unbeaten on 24 and Taylor was on 22 not out as Nottinghamshire reached stumps on 58 for two, a slender advantage of just 22.